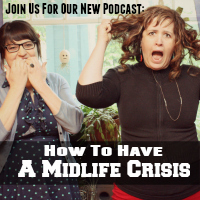 OK, so I’ve decided that I’m going to start mixing it up a bit. As you know I’ve been posting my Fit-tastic posts for some time now and frankly, I’m feeling like I’m ready to start talking about some other things, besides healing. I know, I know, can you believe even I’m bored talking about this stuff now? What I’m not bored with is cooking great food and learning more about food in general. I’ll still be posting my Fit-tastic posts when I feel the need to share something and believe me, I’m sure I have more to share, but I don’t want to feel like I need to produce something every week of such a personal nature. Especially when most of the time these days I’m feeling pretty awesome. Also, I’ve come to see that if someone is looking for a recipe or fact about food, they may not want to have to read all of my personal stories to get there. I want to keep this blog as useful as possible and I think the way to do that is to start writing some different posts. So I’m mixing it up. Some weeks it will be a Fit-tastic Update. Other weeks it will be a recipe or fun facts that I learn about various foods. This is my first recipe without a Fit-tastic Update attached to it. If you’re missing my Fit-tastic Update this week, don’t fret! I wrote this post and a Fit-tastic one this week. You can find this post here. I’ll share it tomorrow, but not today. It’s too much for most people to read in one day. I’m what you might call a reluctant cook. I don’t have a burning desire to cook, but I really like to eat delicious, healthy food so I’ve been stepping up my cooking game. I don’t like to work too hard in the kitchen. I have plenty of work and creative hobbies, so the sooner I can finish cooking and get to my hobbies the better (if you notice here, I’m not even claiming cooking as a hobby). That is why I try to make food in larger portions, sometimes freezing parts of the meal, other times putting away half of it for later in the week or what I like to call for a rainy day. This recipe is one that my whole family loves. They love it so much in fact that we can eat this for any meal, including breakfast, because this recipe is just that good. In this recipe I used chicken, but if you’re vegetarian you can easily substitute tofu or tempeh for chicken. 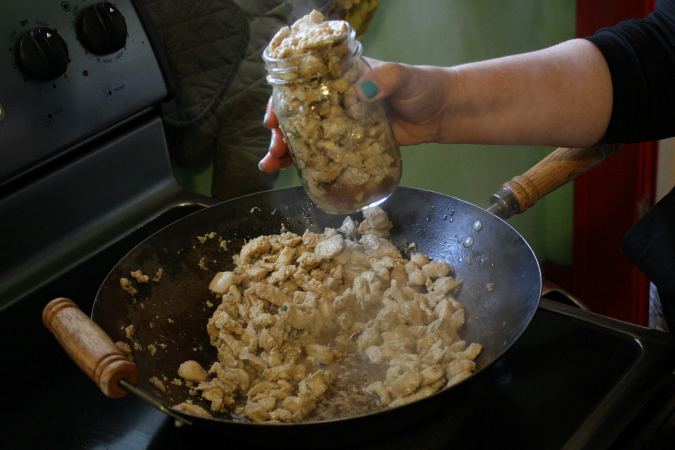 Making the Chicken marinade: I added 1 Tbsp of Tamari and stirred it up with the corn starch. Once it was mixed in with no lumps I added the rest of the Tamari. Making the Pad Thai sauce. 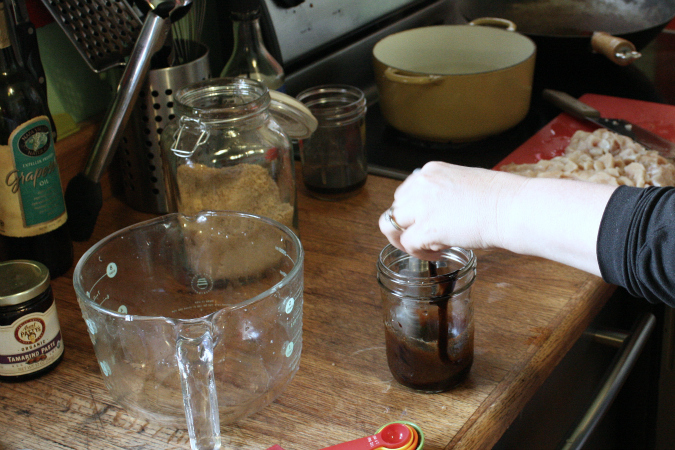 I like to use glass jars for mixing and storing foods in. 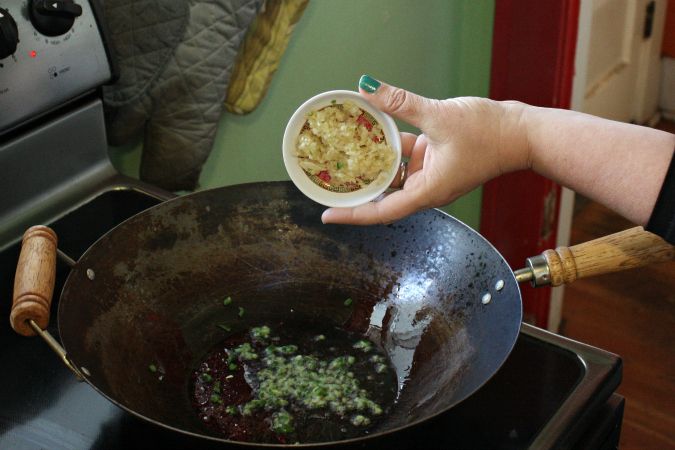 You want your pan or wok to be good and hot before you add anything. You can test by throwing a little water in the pan. If it sizzles it’s ready. I dished up about half (OK, for this batch I saved less than half of the chicken for a rainy day). 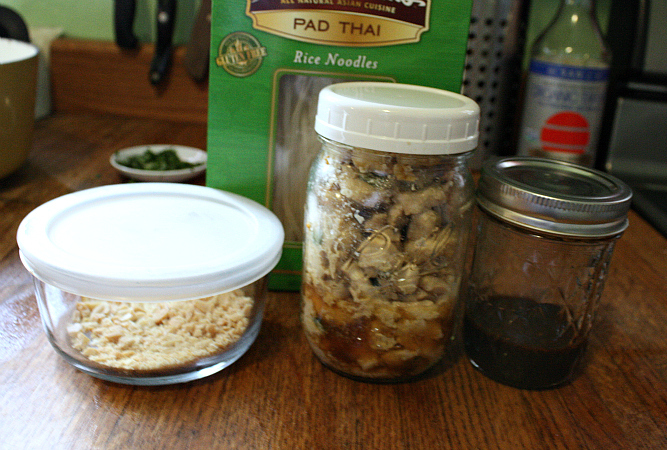 The idea is to separate of the chicken and the Pad Thai sauce to save for a few days from now. Doing it this way is a way that you can make a pretty fresh meal in a very fast period of time within a few days of the first batch. You want your noodles to be slightly al dente. 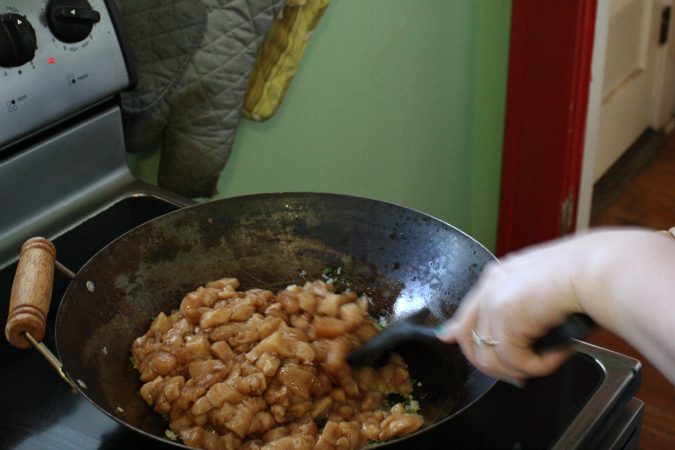 They will cook more in the wok with the chicken in just a minute. 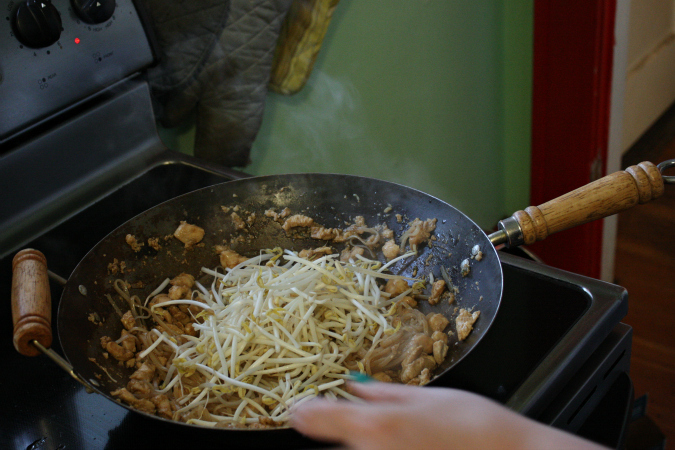 Add bean sprouts and cook for another minute or two. 1. 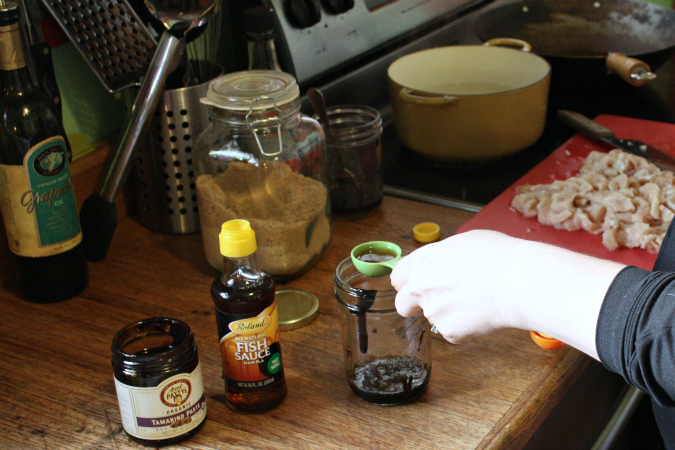 Mix marinade for chicken (or other protein) - corn starch and gf tamari or gf soy sauce. 2. Bring a large pot of water to a boil. 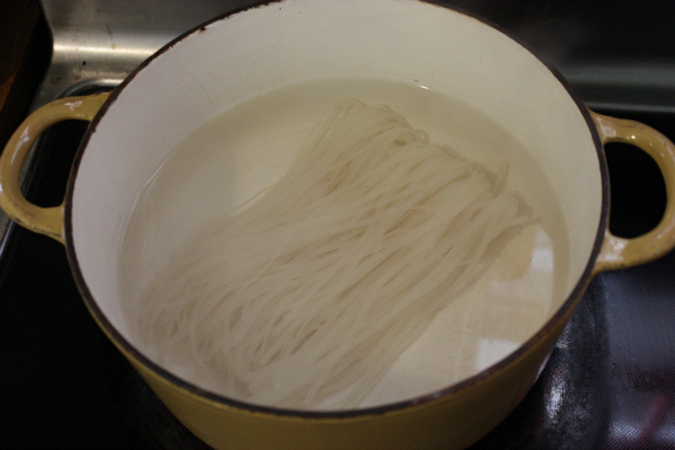 Add one package of rice noodles (save the other for a rainy day a few days from now). Rice noodles cook quickly and you don't want them to be cooked all the way through because you'll be adding them to the chicken later and cooking them a bit more. 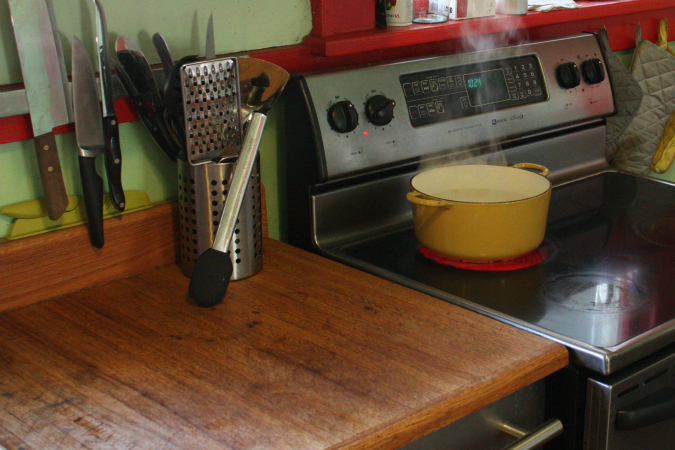 So check your noodles and pull them off the stove when they are al dente. Drain the noodles and run some cold water on them to keep them from sticking. 3. If you haven't already sliced your chicken and removed the white fatty parts, then now is the perfect time to do it. Then add it to a bowl and pour the marinade over it. 4. 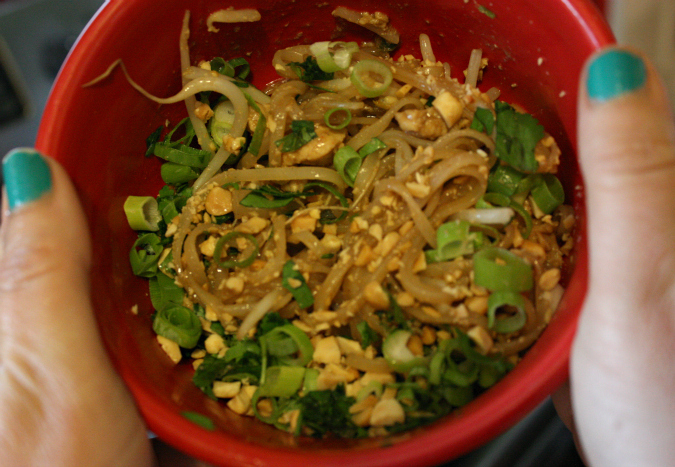 Make Pad Thai sauce. Combine tamarind, fish sauce, cayenne, brown sugar and white pepper. Set aside until later. 5. 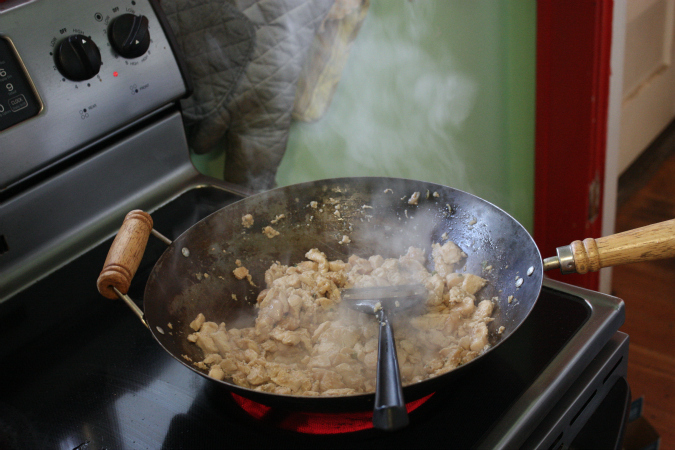 Use either a wok or a large frying pan to cook your chicken and spices in. Warm the pan on medium-high heat. Add grape seed oil to pan - 1 - 2 Tbsp. Add garlic and jalapeno. Stir for about 30 seconds to a minute. Add chicken. Cook 5-10 minutes until chicken is done. 6. Now take half of the chicken and remove it from the pan. Also take half of the pad Thai sauce and put these two items in two containers to save for a rainy day a few days from now. 7. 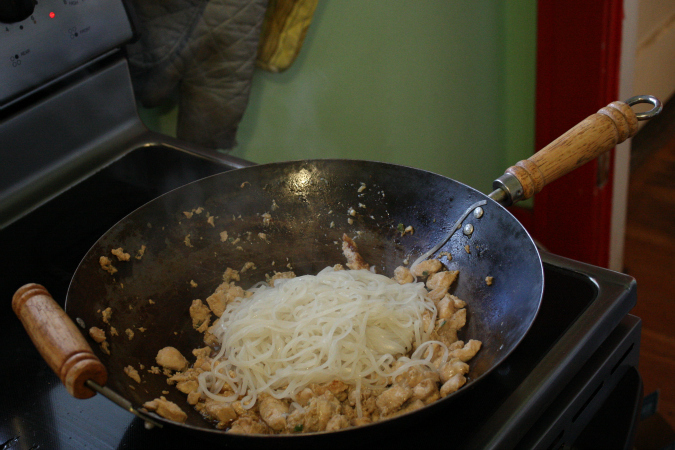 Add rice noodles and pour the Pad Thai sauce over chicken. Gently begin stirring the wok. 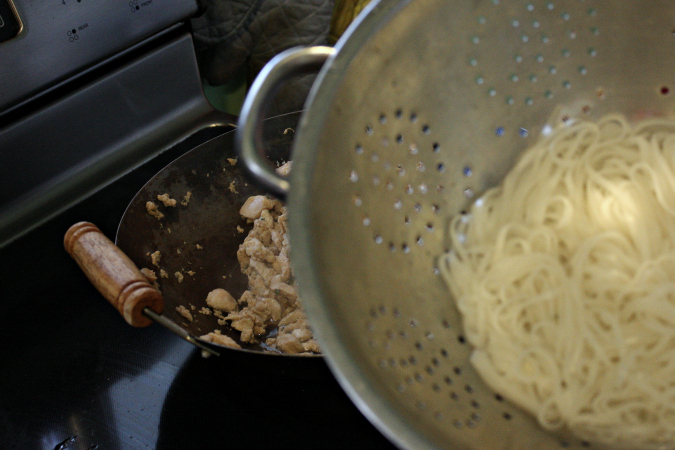 If you can get sort of lift the food from the bottom to the top it helps incorporate the noodles. If the pan gets to be too dry, add oil. 8. 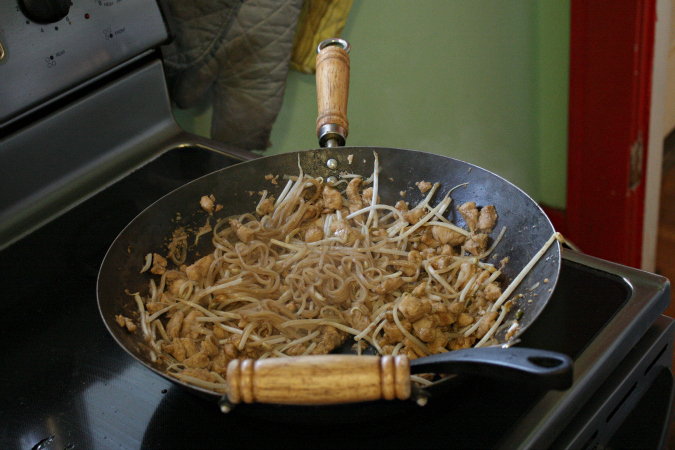 Add bean sprouts to the wok. Fry for 1 - 2 minutes longer. 9. You know when your meal is done when the noodles are no longer hard and your bean sprouts are warmed. This recipe will make two separate meals at least. When I make it divide everything in half and finish cooking half of the portion, while the other half goes into the fridge and I can make it up in about 15 minutes because all the pieces are prepped. I’d love to know what you think of this recipe! Enjoy! Thanks for asking that question! 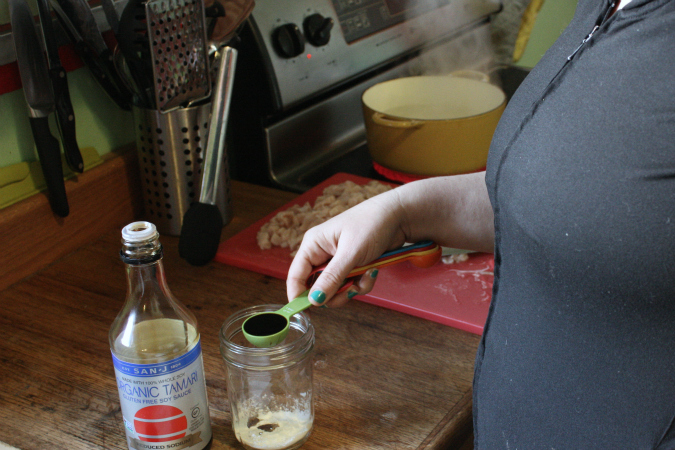 I just updated the post with an approximate number of chicken breasts (6 to be exact). I just used one of the bags of chicken from trader joes. Hope you like the recipe!